In 1866, members of Antioch worshiped under a "bush arbor" erected on the edge of Buffalo Bayou, and as membership grew, a box-house type structure was constructed at "Baptist Hill" (on the corner of Rusk and Bagby) for church ministry and service. During the tenure of Reverend Jack Yates, the membership of Antioch Missionary Baptist Church grew more than four-fold and the box house at "Baptist Hill" could no longer accommodate the growing congregation adequately. And in 1873, a Board of Trustees was elected to purchase land and make arrangements for constructing a brick house. The cornerstone was laid on the 15th day of May in 1875. The church was designed and built by Richard Allen, an architect, and member of the 12th Legislative session (the first Texas Legislative session in which Blacks served). Four years later, on the first Sunday in August 1879, the congregation marched from “Old Baptist Hill” to the new brick church on Robin Street, the first brick structure in Houston to be built and owned by African-Americans located in the center of Freedman's Town, and the present site of Our Church Building. The Antioch of today, nestled between giant skyscrapers and surrounded by steel and concrete, continues to serve the needs of her people and her community, proudly proclaiming the message: Jesus Saves. 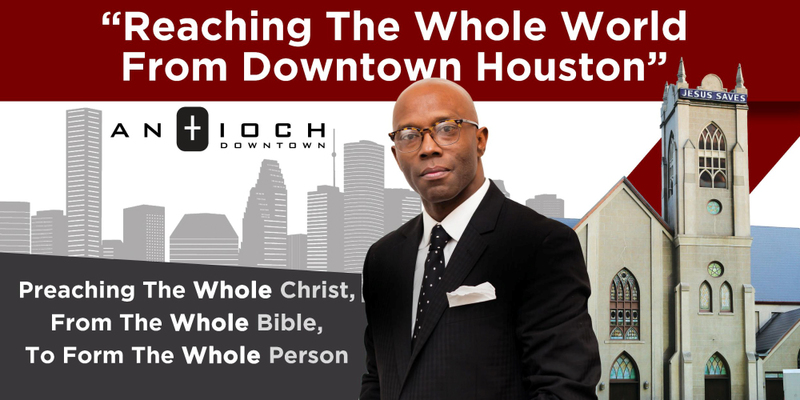 Antioch continues her commitment to the community through assistance to the urban hungry and homeless, weekly luncheon Bible Study for workers in the Downtown Houston area, and aiding families year round through a vibrant outreach ministry. Please join us Sundays at 9:00 am for Sunday School followed by Worship Services and Children's Church at 10:15 am. You can also fellowship with us throughout the week: Bible Study & Prayer Meeting Wednesdays at 6:00 pm and 12:00 pm (Noon) on Thursdays. Check our calendar for a complete list of activities.